Hi everyone!! I had read that saw palmetto is great for hair growth. 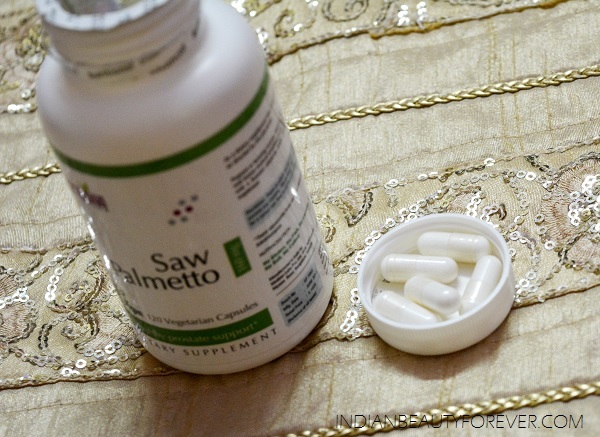 I was not aware about its other benefits but for hair growth, I was keen to trying this supplement that has saw palmetto extracts. Saw palmetto (Serenoa repens) is a low-growing palm tree with sharp, saw-like leaf stalks and deep red berries that grows in warm climates. Price: 1020 rupees for 120 vegi capsules. Supports normal prostate size and urine flow. Helps protect the prostate from excess DHT and estrogen. May help to promote healthy hair growth. Is available in easy-to-take Veg capsule form, at a greater value than other brands. Free Of Milk, eggs, peanuts, tree nuts, shellfish, fish , soy, gluten, titanium dioxide. Other Ingredients: Vegetarian capsules and cellulose. Saw palmetto is a plant that looks like a miniature palm tree, but produces berry fruit instead of coconuts or dates. It is rich in the fatty acids, sterols and flavonoids it contains, and the sugars (called polysaccharides) contained within its berries can be useful as an anti-inflammatory and immune system booster. These capsules are also white in color and the size is ideal to be take orally. Saw palmetto is rich in fatty acids, flavanoids and phytosterols (plant sterols). It also has high molecular weight polysaccharides which may help boost the immune system and may also act as an anti inflammatory. Some studies have shown that saw palmetto is useful in treating benign prostatic hyperplasia (BPH). 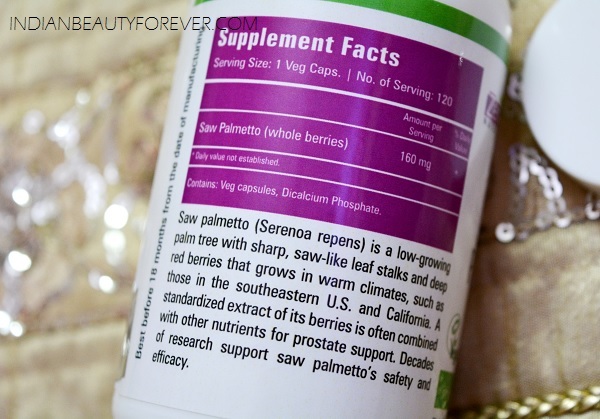 One of the key ingredients in saw palmetto berries acts as an inhibitor for the body’s production of DHT, a chemical associated with prostate enlargement and with testosterone-related hair loss. By blocking the production of DHT, saw palmetto berry extract can also help with blocking hormone-related hair loss (also called androgenetic alopecia or AGA). As a dietary supplement, take 1 capsule 3 times daily with meals or as directed by a physician. I take only 2 like one after breakfast and dinner. 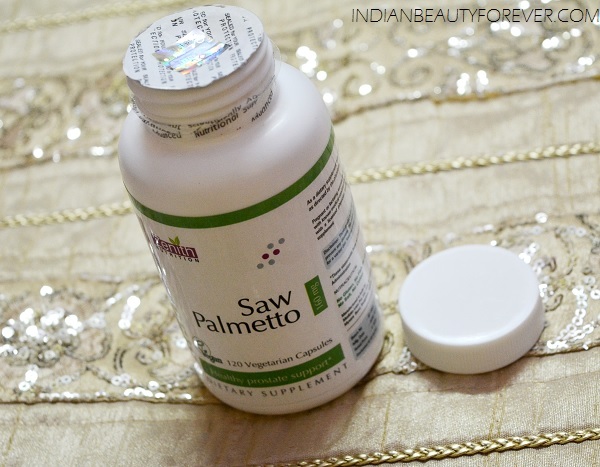 I have heard a lot about the benefits of saw palmetto for hair growth and I am yet to see any positive results since just after taking something for 2-3 weeks, results can'be there honestly but my hair feels bouncier than ever, which I like. 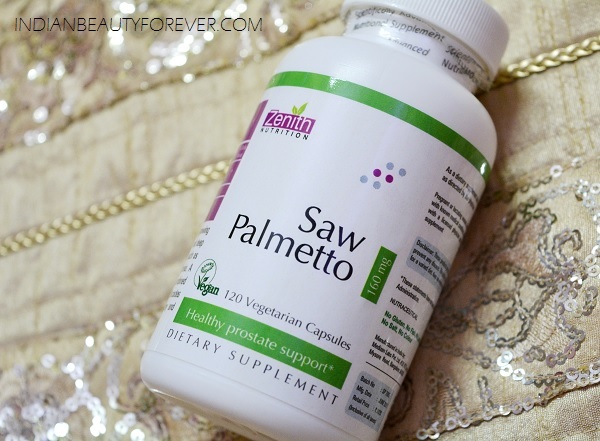 Have you taken any Saw palmetto supplement yet? You can also take this along with biotin.